Rivers State Governor, Nyesom Ezenwo Wike has declared that only those in support of political armed robbery will kick against his declaration that those who plan to rig election in the state will be resisted. Governor Wike also stated that desperation for power was behind the killing of Ogoni people via an ill-fated military operation last Monday and Tuesday. He said his administration will stand firm to protect the Ogoni people. 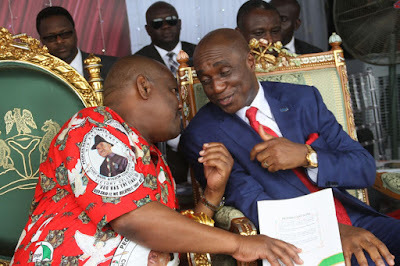 Speaking on Saturday during an interdenominational Thanksgiving and Victory Celebration of the historic Supreme Court verdict that validated his election, Governor Wike said he stands for free and fair rerun elections in Rivers State, declaring that nobody will be allowed to subvert the mandate of the people with the use of the military. The governor noted that it is the responsibility of the Independent National Electoral Commission, INEC, to conduct credible rerun elections. He, however, said: “Let me reiterate. If any INEC officer is bent on rigging the rerun elections, let him first tell his wife and children where his will is located because he will be treated as a political armed robber. The governor said no matter the number of soldiers introduced in Rivers State, the people will protect their votes and PDP will emerge victorious in all the rerun elections. Governor Wike who led the congregation to observe a minute silence for those killed by the army during an ill-fated operation in Ogoni Land on Monday and Tuesday, announced that the Rivers State Government will cater for the needs of the widows, their children and all the loved ones of those who lost their lives. He urged the people to vote for the PDP in all the forthcoming re-run elections in the state. “When I went to Luuwa for the 50th Birthday Celebration of Senator Lee Maeba, I told our people not to vote Senator Magnus Ngei Abe and the APC. There is no way I will play anti-party. Magnus Abe is my friend, but the people of Rivers South-east Senatorial District should vote Senator Olaka Nwogu. We have a duty to make sure that the APC does not win a single seat during the March 19 rerun elections “. He said that though he supports the security agencies to fight against criminals and criminality, he will never support the killing of innocent Ogoni people as was the case during the ill-fated operation. The governor said that the state will never be tired of thanksgiving, because it was delivered from the evil machinations of the enemies of Rivers People. In his address, Ekiti State Governor, Ayo Fayose said the Supreme Court verdict cleared the mess of the process and planted the rule of law. He described Governor Wike as a man destiny who liberated Rivers State from the shackles of political bandage. Also speaking, PDP National Chairman, Senator Ali Modu Sheriff said that the Supreme Court Justices simply confirmed the will of Rivers People by the verdict. Preaching at the PDP interdenominational Thanksgiving Service, Pastor David Ibiyeomie of the Salvation Ministries said thanksgiving opens the way for more blessing. The PDP Thanksgiving and Victory Celebration for the Supreme Court verdict attracted thousands of Rivers People from the 23 Local Government Areas of the state.